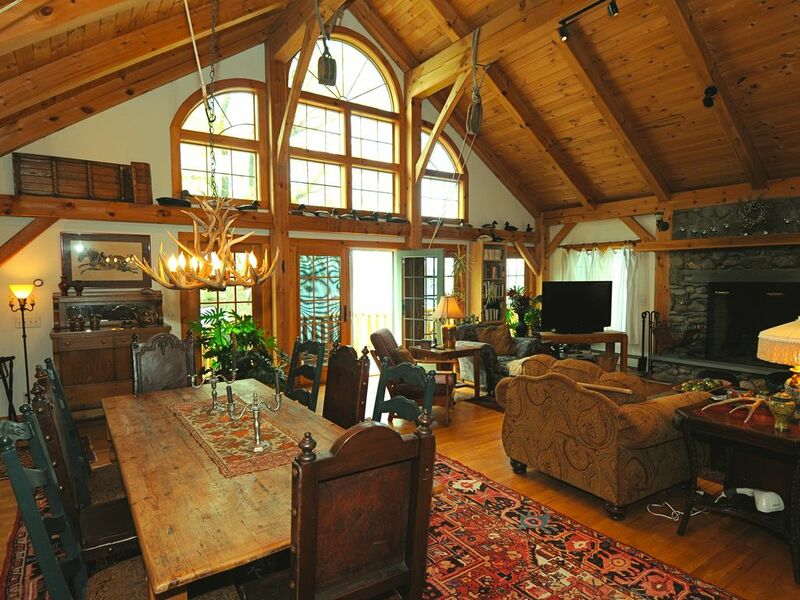 Broadlake Retreat is a 4000-square-foot furnished home with a backyard wildlife habitat directly on the shore of Lake Champlain. The style is eclectic: In our many renovations, we've used earthy and regional materials such as fieldstone, VT green slate, VT farmhouse doors, Vt white pine post & beams, Mexican tile and hardwood flooring. Entering the Retreat one looks up to a 20-foot- high post & beam ceiling with a wall of lakeside windows. A short stairway leads into a spectacular 20'x30' Great Room. French doors open to a lake-front balcony. A massive Rumford fieldstone fireplace invites an elegant gathering; soft chairs and sofas keep the group together. The Great Room seats eight for a formal dinner, under a Colorado chandelier of naturally shed antlers. Oriental carpets on hardwood floors replicate the grand Adirondack "camps." Beneath the Great Room is a sizable post and beam gym/lounge with tiled floor and a Hearthstone wood-burning stove. You'll find an elliptical that faces a 40" flat screen TV, a Bow-flex, two stands for stationary bikes -- bikes are provided, a selection of free weights and yoga mats, and a regulation massage table. A sofa bed provides additional sleeping or late-night TV-watching. Amenities include a lounge chair and a full-sized refrigerator. The white kitchen has granite counter tops, stainless appliances, an alcove window over the sink, and a granite-topped island with four padded stools. The smallish kitchen is enlarged by an open keeping room with a wood-burning stove in a slate hearth and a farmhouse table long enough to seat eight. The lake-end of the room includes an L-shaped sectional sofa and leather recliner that face the lake, just steps away. Antique structural ceiling beams (from an old mill in Winooski) give a rustic old-world feel to the first floor, including the bedroom with a sleigh bed and an alcove window. Every room at the Retreat features hardwood or tiled floors, oriental carpets, antiques, original art; and a few rooms have antique stained glass or leaded glass windows. It is a soothing environment, made nearly hypnotic by the panoramic 180 degree view of blue-gray water and purple mountains. The first floor bathroom has a built-in porcelain tub/shower and sparkles with white ceramic tiles. Also has an alcove window and a tiled vanity with a painted sink. A large laundry/pantry room features washer and dryer, clothes steamer, and many shelves of serving dishes, baking pans, glassware and table linens. This room has all the kitchen supplies you need to prepare dozens of delicious meals. Another set of stairs off of the keeping room leads to the second floor bedrooms. An atrium ceiling with skylights and huge ceiling fan keeps the upper hall light and airy. All three bedrooms enjoy high cathedral ceilings; two are equally sized and share a bathroom, which has a tub/shower and a skylight. But frankly, it is the master suite that wows guests. A queen-sized canopy mahogany bed, hand carved in Hickory, North Carolina, stands regally before French doors that open onto a private balcony, which is somewhat hidden in a willow tree. The 12'x 26' bedroom has ample space for two large dressers, a linen cabinet and a fabulous overstuffed chaise that overlooks the long beach below. The master bath features a pristine viewpoint: a lakeside antique claw-foot x-long tub. A white tiled enclosed shower is well lighted with a wall of wavy-glass vintage squares that refract the light from off the water. The property enjoys a set of sturdy metal steps (with railings on both sides) to a 40 ft dock extending from the 90 ft-long seawall, giving access to a sandy bottom, and if it's late summer, we'll have a sandy beach (depends on lake level). Moor your boat: a shallow- water mooring on a 200 pound mushroom anchor, big enough to hold a 22- foot boat. The boat launch is close by on Winooski River. Great fishing!! You'll enjoy use of two kayaks and an SUP (stand-up paddle board) and plenty of floats. The large brick patio is great for grilling and eating, with seating for 10 under an umbrella, with a fun fireplace to roast marshmallows. This is a private, green, and shady yard, bordered with firs and pines that, with two willow trees, keep us feeling far from the madding crowd (though just 15 minutes from Burlington). You'll be delighted by our feathered friends, both migratory and local. FYI -- We are a LGBTQSafe Space. News for 2019! We have a new screen porch directly by the lake with a vintage cushioned glider and chairs. Also, we now include our first-floor working office (10'X11'), complete with big lakeside windows, a laser printer, a ream of paper, hi-speed internet, an L-shaped spacious desk/wall unit, reading chair and a library. The garage is not available. There are two permanent parking spaces in the driveway, with room for a visiting third (behind one car). Owners have two dogs, but they won't be near the property while rented, nor will their fur. Closet space is limited to one large walk-in, a large foyer coat closet, a few smaller closets, and hanging bars, or armoire, in each bedroom with hangers. Our WILDLIFE HABITAT requires that birds and little critters are fed daily. Either of the two owners comes by daily, early morning, to feed them. We expect our guests to treat the wildlife kindly and alert us to any possible problems (say, if a bird is injured) before they call anyone else. John and I jointly manage Broadlake Retreat. We have high standards: I was a Gourmet magazine travel writer in my former life and rated destination properties for excellence. Here, guests can expect the same attention to detail and hospitality that rates five stars. Since John or I visit the Habitat daily, briefly, we can assist guests with any questions. Why Colchester? I've seen no lakefront property quite like this eclectic home. We've lived here for decades, raised a family and continued renovating, improving the house. Only in the last few years have we encouraged a wildlife population of songbirds, pigeons, predator birds, and migrating shorebirds. Now, Broadlake Retreat is so much more than real estate. Our yard and shore have gradually grown a bit wilder with wildlife. I often see flutters of wings in my peripheral vision -- here life abounds. And with the raw breath of Lake Champlain gusting through our dreams, so close, we too feel more alive here, and calmed. Burlington is 15 minutes away by car, on a convenient belt line. Broadlake Retreat is very near the Bike Path, which takes cyclists either south, to Burlington, or north, to the Champlain Islands. Our beach emerges as Lake Champlain's water level drops, anytime from mid-July through October. Until then, we have steps down to a 30-foot dock. Close lakefront is enabled with a concrete seawall: the house is 20 feet from the waves, early season June/July, when the lake is high. Lake views at the Retreat are panoramic, a full 180 degrees. You can see Mount Marcie, and even Whiteface on a clear day. The Retreat is north of Burlington, on the Broadlake, the wide part across from N.Y. It's a small bay where kite surfers abound. We are a haven for migratory shore birds in May/June, & then September. 2018 22,000 BTU Frigidaire AC unit cools first floor and the bedrooms, with help from large ceiling fans, and rotating fans in each bedroom, the gym and the Great Room. Always 100 percent cotton bed linens and towels. We have a variety of lovely table linens including tablecloths, indoor and out, and placemats..
Large Rumford Fieldstone Fireplace in the Great Room. A funky-fun brick fireplace on the patio facing the lake for chilly nights. Two spaces in driveway with room for a third behind one car, though a bit tight. White cotton bath towels and washcloths are provided, as well as 8 beach towels. Bow-flex, Elliptical, free weights, bikes, yoga mats, regulation massage table, refrigerator and pull-out sofa bed. Avalon Olympic Woodstove in the keeping room. Hearthstone Woodstove on Fieldstone hearth in the gym/lounge. Two living areas, a large great room and a keeping room. Both have large dining tables, couches, side and coffee tables, throws, and bookshelves, complete with a lending library during guests' stay. 2019 Whirlpool stainless side-by-side refrigerator; an additional refrigerator in gym. Basics: spices, oils, vinegars, various baking flours. Fiesta ware dishes, variety of pans, casseroles, serving bowls, salad bowls; serving platters, flatware for twelve both in kitchen and in great room. Seasoned copper-bottom Paella pan. Two dining areas: 1) a long farmhouse table with 8 padded chairs next to kitchen, and 2) an antique table in the great room that also seats 8. Extra chairs available. Direct TV. High speed internet WIFI. 0n 2 of the 3 TVs. Wide variety of books, classics as well as mysteries and popular literature. Guests feel free to use the lending library while here. Many board games, backgammon, cribbage. A wide variety of titles. Potted herbs and flowers abound on the brick patio. On lawn, many conifers and two willows provide shade and privacy. Two lakeside balconies, one on master bedroom; one on the Great Room. Complimentary: Two kayaks and one SUP. Four bikes are also provided (for the great bike path) Additional bikes can be rented at many places in Burlington. A 200 pound boat mooring and float is available. Not very deep, depending on time of season. Antique brick patio; new 2019 lakeside screened porch with vintage glider. Outdoor furniture includes large table/umbrella and seating for 10. Three chaise lounges and six cushioned lakeside chairs. 2 tennis courts available at Airport Park, just 200 yards from property. 3 golf courses within 30 minute drive. FYI: there are two slate 5" steps to the front door and the first floor; kitchen, laundry, living room, a bedroom and bathroom are on first floor. There is one small 3" step from kitchen to sunroom, which is level with the back yard. However, the second floors involve two staircases that ARE NOT WHEELCHAIR ACCESSIBLE. Added for 2019 season: A first-floor lakeside working office with desk, chair, printer & a ream of paper, hi-speed internet, a reading chair and a library. Also, a lakeside screen porch with a vintage glider. Lake Champlain at its finest. Highly recommend this home. Amazing View. Great Owners !!! Family Reunion that we will always remember. The view is amazing and had lots of square footage for a bit of privacy for everyone. Large family room for playing Games with all 11 of us. and the kitchen table accommodated us as well with the island and bar stools too. Don't miss this wonderful home . Hotel nearby to handle the overflow. Great location to see many attractions as well. We will hold this dear in our memories for a long time. We love the way the Retreat brings families and friends together, giving each one space inside and outdoors to reflect, read and get out on the lake. This family was awesome: friendly, interesting and engaging -- even welcomed us to their family party! They were respectful of wildlife and property and always so kind. Eight adults stayed at the Retreat and others stayed at a nearby hotel, but they all convened at the lake and seemed to have a grand time of it. Highly recommended, the Wildermans are a delight, and we hope for their return next year! Thank you. We stayed 9 days in this spectacular house. The location couldn't be better - right on lake Champlain and only 20 minutes to downtown Burlington. We never stayed in a rental, which was so well equipped - everything you need to cook, games, bicycles and canoes. There are many beautiful places in the garden to relax, enjoy a cup of coffee and watch the birds and the kite server. We watched breathtaking sunsets. John and Catherine are great hosts, very welcoming and always ready to assist us. We enjoyed very much meeting them. We will be back! It was awesome to meet Judith and Heiner with their family at Broadlake Retreat, to see the relaxing, positive effect this place can have on busy travelers. From an owner's perspective, it is so worthwhile to leave our home to people like them who appreciate nature, the lake and the wildlife habitat, and who value the peace of a great night's sleep in a big, beautiful lake house. We look forward to welcoming the Kochs back anytime. *FYI We have no canoes, but two kayaks are available! My family, a group of six adults and one baby, just spent a week in heaven aka Catherine’ House. From the moment we walked in until our bittersweet departure, we were relaxed, pampered by nature and in full relaxation mode. I cannot imagine an easier place to immediately slip into that deep breathing, slower paced life that defines vacation. The house is more than fully equipped, the location is incomparable being directly on Lake Champlain and the kayaks and boards and floats enticed us constantly to float on the peaceful warm lake waters. Our hosts were the best imaginable and available with recommendations and advice whenever we requested. The rooms are perfectly appointed, the kitchen fully equipped and did I mention the views? The sunsets? The hardest choice sometimes was deciding where to sit and which view to enjoy. If we can ever make it back to Burlington, this is the only place we would stay. We felt at home and now are a bit homesick. Thank you for sharing your home with us - we have incredible memories. One couldn't hope for nicer guests! Denise was a great communicator before and during their stay, enabling us to fine-tune the details -- very helpful for hosts! The family was considerate of our house rules and always so positive about the property. Vermont has been unseasonably hot this year, yet even about this Denise never complained. These are the kinds of travelers hosts love: gracious, seasoned travelers who know what they like, who are clean to a fault and kind beyond measure. (We hope to entice them back with our newly installed mega air conditioner!) Denise and family will always be welcomed at this lakeside retreat.